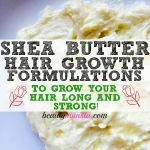 Detangle Easier with this DIY Shea Butter Hair Conditioner - beautymunsta - free natural beauty hacks and more! 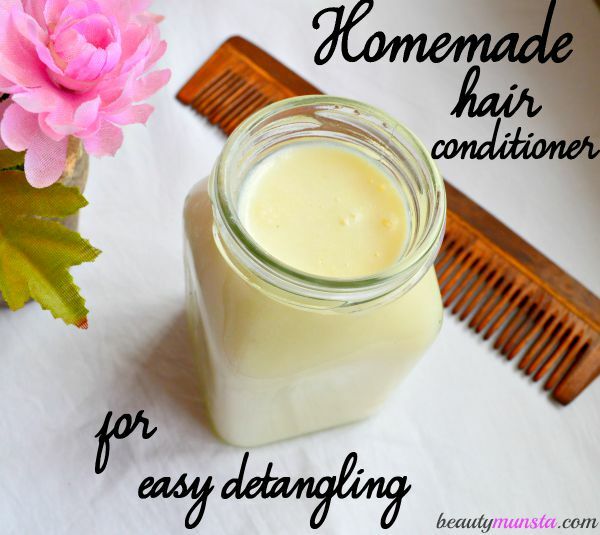 Detangling was a big issue for me a couple of years ago. It was a painful and time consuming task which brought tears of frustration in my eyes, especially when I saw the big chunk of hair stuck to my comb at the end of the whole process! I was even scared to wash my hair because I knew I’d then have to detangle which meant losing more of my hair while trying to get all the tangles out. I used Tresemme hair conditioner enriched with argan oil for easy detangling after getting inspired by one of my favorite Youtubers but unfortunately, it did not work for me and I stopped using it altogether. To get rid of this frustrating problem, I used gallons of oil and combed through to make my hair absolutely tangle free – I really hated having flat & oiled hair but it was the only thing that helped! 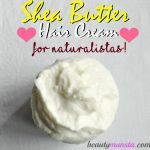 I finally decided to cut off half of my hair and now, after this amazing HOMEMADE shea butter hair conditioner recipe, I haven’t been having any problems with detangling! I feel like a free bird! XD You’ll be amazed at how easy to make it is. It contains just FOUR ingredients and I’ve listed down all the benefits in my ingredient profile below! 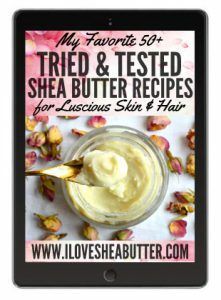 ➝ Shea Butter – I’m head over heels in love with shea butter. It’s truly amazing and has literally changed my life for the better. Rich in Vitamins A, E, K and F it is intensely nourishing and moisturizing for the skin and hair alike. It’s an excellent sealant, making it one of the best nature’s ‘foods’ for natural hair. ➝ Coconut Milk – For ages in India and the Philippines, coconut milk has been used as a food and beauty product. Women apply it on their hair to make it smooth and give it shine. It’s rich in protein and healthy fats that nourish the scalp and hair strands and strengthen them, which prevents breakage and damage. ➝ Raw Honey – I use Rowse’s organic honey which has an absolutely scrumptious aroma! 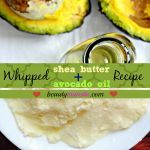 I love using it in many of my DIY shea butter recipes, also because it’s full of powerful antioxidants and nourishing nutrients. Honey is a wonderful conditioner all on its own and it’s a humectant which seals moisture into dry hair. ➝ Palmarosa Essential Oil – I recently discovered this essential oil from a naturalista and it’s so worth it! Palmarosa essential oil has an uplifting scent with a hint of rose which makes it smell romantic and exotic. It’s antiseptic, antiviral and hydrating properties make it a great essential oil for skin care. Into your blender/food processor, add raw shea butter, coconut milk and honey. Blend for 10 seconds or more, depending on your blender, until you get a thick liquid. 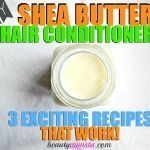 And your shea butter hair conditioner is ready! Now all you need to do is transfer it to a glass jar, applicator bottle or even a pump bottle. It’s not a leave-in condish so make sure to wash it out. Then add 10 drops of palmarosa essential oil or any of your favorite essential oil and shake well to combine. It’s ready for use! You can store it in the refrigerator for up to a week or more! Apply a suitable amount on your hair length and let it sit for 30 minutes. Wash with shampoo and voila! Easy detangling & soft hair! For natural hair, you can use it once a week on your wash day, after shampooing. Make sure not to get any water into it so that it doesn’t spoil – that’s why it’s a good idea to store this in an applicator bottle or pump bottle so that you won’t have to scoop it using your fingers. Feel free to substitute coconut milk with regular full fat/skim milk or any plant/nut milk of your choice, especially if your hair is protein sensitive, since coconut milk is rich in protein. You can also mix 2 tbsp of coconut milk powder in enough water to make a semi-thick milk and use it instead if you can’t find coconut milk. You can massage this conditioner on your scalp as well since it is rich in scalp nourishing nutrients that can strengthen the hair follicles and promote growth! 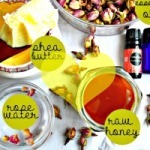 Want to make your own herbal hair oils? Check out our DIY Herbal Hair Oil Infusions eBook that contains an A-Z list of healing herbs and spices to infuse for hair, what base oil to choose for your hair type, methods of infusing your hair oils plus 20 exciting hair oil recipes for dry hair, heat damaged hair, hair growth, even gray hairs, scented hair and more!